I hope everyone had a great new year and are ready to head back to school. We have in-service on Monday and students return Tuesday. I've had a request for some resources for helping students use and practice commonly confused words. Click on the images below to download the free Bingo game. 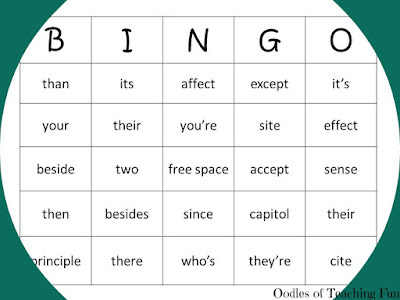 Click on the image to download my Commonly Confused Words Bingo Set. The set has ten different bingo cards and a list of words with definitions. I plan on reading the definition out loud to the students for them to find the word on their bingo card. I laminate the meaning sheets and mark them off with an expo when I call them out to the students. I also laminate the students cards and they use expo markers to mark their words, instead of using those pesky circles that get every where.